the analogue fan and anyone looking for a high-end audio and video experience. vinyl LPs, pre-recorded reel-to-reel audiotape, 8-track carts and cassettes. The inventory was built with the serious collector and fan in mind. 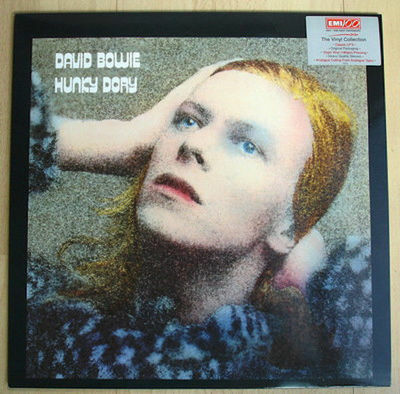 David Bowie ‎– Hunky Dory Label: EMI ‎– 7243 8 21449 1 5 Series: EMI 100 – LPCENT 21 Format: Vinyl, LP, Limited Edition, Reissue, 180g Country: UK Released: 1997 Barcode (Printed): 7243 8 21449 1 5 EMI sticker on front cover: "EMI 100 - 1997 • THE FIRST CENTENARY" Contains lyrics sheet insert on thick paper. Glossy cover. LPs professionally boxed for shipment. Packages to these countries will be sent 1st Class International (provided the package weight qualifies) without the need for registration costs.